Current address: 20130 Highway # 35 North. 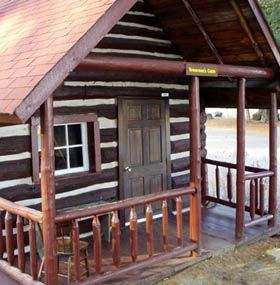 The Towerman’s cabin sits beside the Algonquin Highlands Trails and Tours office/store beside the former Frost Centre on Hwy 35. 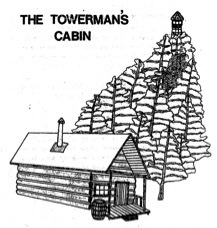 After the first fire tower was built in 1922 at what is now the Frost Centre, a cabin was constructed to accommodate the towerman. The tower observer’s life was a lonely one. Many were bachelors who enjoyed living in solitude. Some were married and had families living nearby. 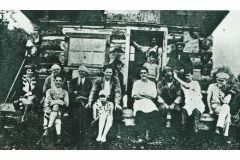 Jim Austin (in doorway) and Tom Walker (seated in front) were the first two fire rangers to occupy the cabin at St. Nora’s. On his days off Jim Austin paddled to nearby Brady’s Lake to visit his wife and 17 children. Every morning during fire season from April 1 to October 31, they would walk the long trail and climb to their lookouts. A bushline telephone system linked the St. Nora’s cabin with Dorset. Walking the bushlines keeping them in repair or patrolling by canoe were other duties when the rangers weren’t in the tower. They were also responsible for keeping a diary that was mailed to the head office in Toronto at the end of each month. At other times the rangers were busy cleaning debris, clearing portages, and talking to the public on behalf of the Department of Lands and Forests. Understandably, boredom frequently accompanied such a job. The towerman often played a musical instrument such as a harmonica or fiddle for entertainment. At the end of the season, the ranger would usually return to the bush to trap or log waiting until the following April to return to his fire ranger duties. Photo information & source: First Fire Rangers (above) photo supplied by J. Earl Hewitt for Echoes of the Past, compiled and written by Ed H. Devitt & Nila Reynolds.